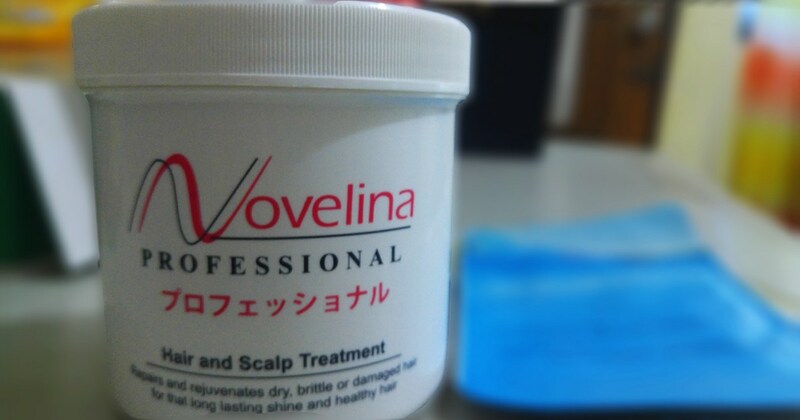 A review of Novelina Professional Hair and Scalp Treatment after using it for 10 days, about Novelina, and where to buy this product. Here's a perfect do-it-yourself solution for restoring your hair’s lost moisture due to chemical treatment or everyday styling. Straightening your hair via hair rebonding would yield better results with Brazilian blowout but of course, you'd need to pay more for the added treatment. On top of this, you need to maintain your hair regularly. At the very least, a good 3-minute miracle conditioner daily will help. But if your hair is severely damaged (this happens after hair straightening and worsens after the coloring), and you really want to give your hair that repair and rejuvenation it deserves, you need effective treatments. I know my hair needs it. I am just not sure which effective product to use (by that I mean something cost-effective too). Good thing, I got the chance to try out Novelina Hair and Scalp treatment. This hair treatment looks promising. It claims to contain "a hydrating blend of emollients that are sure to increase moisture retention in hair". The container says plenty of good things about this hair and scalp treatment. See the box below. The label already gives a good impression. Before I used this product, I have my points for concern: Will it strengthen my overly-processed hair? Will it rejuvenate my dry, brittle, damaged hair? I was also curious about the scent. But it turned out to be true as indicated. The scent is clean. It is not as calming and appealing as the other product I used several years ago. I forgot the name of the product, it is also from Japan. But maybe it's a good thing? Maybe it being not so fragrant means there is no additional chemical/ artificial ingredient to affect my hair? IDK. After 10 days of use, I can say the results are favorable. As expected my hair is soft and looks less dry. I like the fact that there is not much hair fall every time I rinse. This is usually my problem (and what I fear the most) whenever I try out new hair products. I am starting to like Novelina! I wanted to test how it would affect my hair strands so I purposely skip combing after every shower. I know it sounds lazy. But luckily, my hair would still be soft and manageable after it dries. As expected, after hair rebond plus coloring, my hair drastically loses moisture. That said, I need Brazilian blow dry and regular keratin treatment to recover the "shine". I am glad Novelina offers this solution minus the hassle of going to the salon every time. The product is affordable too! I had used Monea powerdose treatment before and Novelina seems to yield similar results at almost half the price. Monea is around 500 pesos for 250g. Novelina is around the same price but with 500g. Novelina, a novel line of hair care and skin care products that will defy age and redefine beauty. Behind the Novelina brand is a guarantee of quality, efficacy, and safety. The special Japanese formulations are the result of extensive research and development that incorporates not only the newest ingredients but the latest technology as well. The uniquely blended ingredients are manufactured under strict quality control procedures resulting in products that offer reasonable/affordable pricing without compromising benefits. You can also buy it from LAZADA and other super markets. Novelina is a good treatment for chemically treated hair. I recommend you use it before and after a hair rebond or perm. It surely delivers what is promised on its packaging. It's affordable too! 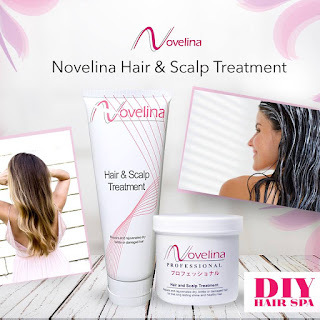 Have you tried any Novelina products? What do you think about this hair and scalp treatment? Would you like to try it? I'd love to know your thoughts in the comment section below!